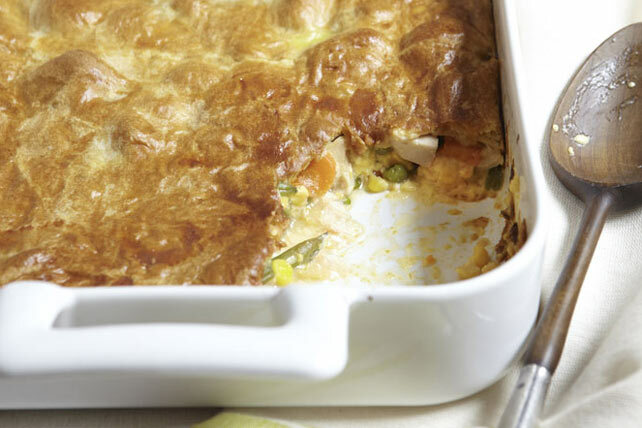 Bring a delicious filling to a delicate crust with this Cheesy Chicken Pot Pie. Our Cheesy Chicken Pot Pie features veggies and chicken in a cheesy sauce. Combine first 4 ingredients in 13x9-inch baking dish. Unroll dough; place over chicken mixture. Bake 20 to 25 min. or until crust is golden brown. Save 40 calories and 4g of fat, including 2g of sat fat, per serving by preparing with 2% Milk VELVEETA, 98% fat-free condensed cream of chicken soup and refrigerated reduced-fat crescent dinner rolls. We appreciate your comments, and we agree that thawing the vegetables first produces a better dish. Thank you for all of your suggestions! Place vegetables in a colander inside a bowl and run warm water over them; let stand 5 min. or until they are thawed. Drain.